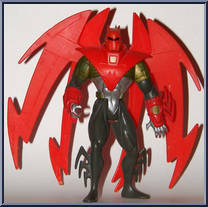 Dressed for all-out battle, the mysterious super hero Azrael hits the streets of Gotham City posing as Ultra Armor Batman. He works for the forces of good when the true Batman is unable to, putting his full body armor and high-tech wings to the ultimate test against the nastiest villains he can dig up, then finishes off the job with his super-charged blasting battle cannon. Crime won't gain a foothold as long as Ultra Armor Batman carries on the Batman legacy. Contribute pictures, update details or suggest corrections for Batman (Ultra Armor). Write a review about Batman (Ultra Armor).